From the 21. until the 23. of April the world at the Coating_Industry met at the international trade show - the European Coatings Show in Nuremberg. On about 30.000 quadrad meter exhibition space scrimmage 887 exhibitor and 26.000 visitors, which where interessted on the new trends in the field of production and construction of paint and lacquer. At that peak result on the trade show the exhibitioner where very happy. At the opening of the doors from the hall on the first day the international audience flowed the trade show. And we are welcome a lot of customers and potential new customer, from different coutries on our trade stand. Lively and active where the customers at our trade stand. Our product range of the different agitators, and the different agitator solutions, where very interessting to our customers. The just for the ECS constructed column agitator fast chancing components, and with a complete control unit is complete ready for delivery. 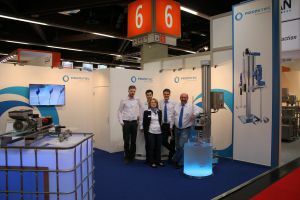 Also our IBC-Containeragitator PROMI CON 600 with the advantageous cone impeller system PROMI JET find a lot of appeal, summed up Tim Strecker, director of sales and excecution of the PROMITEC GmbH the very succesfull dasy of the internation trade show.